What a lot of people would like is to have high yielding dividend stocks (4%-10%) to compliment their growth stocks or to provide passive income. 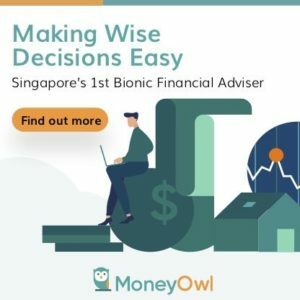 Singapore Dividend Stock Tracker lists Singapore best known high yield stocks and follows their yield payout, price to book, free cashflow yield changes daily. There are 3 telecom stocks in Singapore and they do provide good yields ranging from 4.5% to 8%. Electric utilities, high ways, toll roads, air port, marine ports and oil & gas storage are high capital expenditure business that creates great barriers to entry. This make their cash flows very predictable and defensive. Since they are high capex, they tend to be funded by large amount of debts, so investors would have to take note of their debt financing plans. 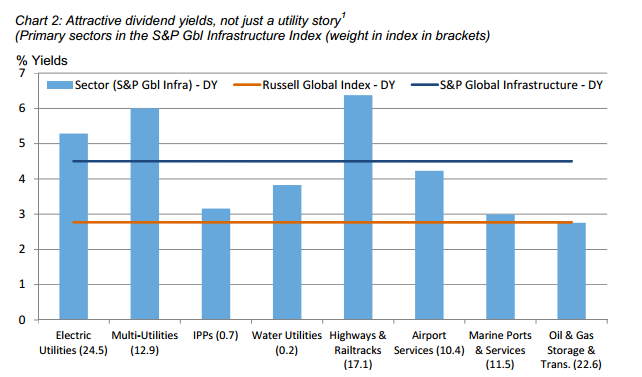 Here is a comparison of what kind of yields you can look for based on US infrastructure stocks listed. Note that in Singapore they would tend to be 2% higher. Good Growth – must grow instead of becoming stagnant. For dividend payouts to grow. Good Yield – 4%-7% yield. High yielding stocks tend to be because of high payouts which might not be good long term. Build a long term income stream today! What are the pros and cons of investing in dividend stocks? What are the selection criteria? How do you know if it works? What are the pitfalls to watch out for? 5 Steps Guide to making Compounding work in Dividend Income Investing: How do we make compounding and time value of money work to build our wealth through dividend investing? This article explains a 5 step process to achieve that. Does Dividend Stocks Beat the Market? 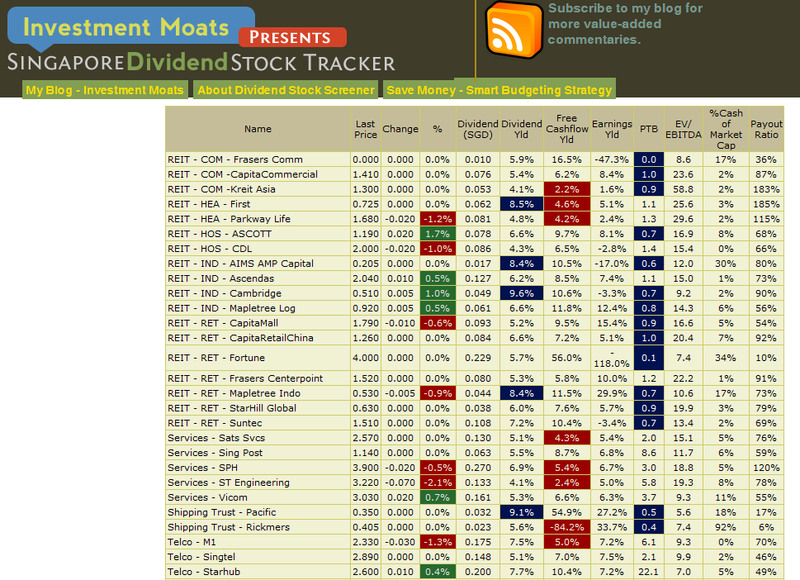 : What are the long term returns of dividend stocks, are they defensive? Will it be better if you invest in broad market index? Total Return Matters: Do not get blindsided by high dividend yield or capital gains. Total return matters in this Noble Group example. Focus on earnings payout, good business model dividend income stocks: High yield is not always ideal. What matters more is the sustainability of dividends in the long run. Stock Valuation and Dividend Sensitivity Analysis: How does price and dividend affect each other: Market demands a certain yield and your stock’s price may change due to it. Identifying the Business Model of your Dividend Income Stock: Dividend stocks can be self- renewing or liquidating. It is important to know what you are buying into. This article explains why. Dividend Stocks with strong fundamentals likely to outperform after a crisis: Fund Manager talks about how a mix of dividend cows and dividend growers will do your portfolio well during both bull and bear. How a Fund Manager chooses his dividend stocks: Here is a good list of criteria a global dividend fund manager use in their dividend income stock selection. An illustration of how Dividends and Spin-off hugely matters in overall returns: Here is a nice article to talk about how a stock ends up going nowhere but factoring dividends and spin-offs and their dividend, the returns are enormous.